According to NZ3109 standard, concrete curing is defined as concrete “being maintained with minimal moisture loss for the period necessary for hydration of the cement and hardening of the concrete”. In the context of this bulletin, hardening of the concrete is interpreted as being the “process by which hydraulic cement hydration reactions occur so that the potential properties of the concrete mix may develop”. It is known that lack of effective concrete curing can sometimes equate to leaving half the cement out of an efficiently cured concrete mix. Without curing assistance strength development, impermeability and abrasion resistance performance can be severely compromised and drying shrinkage increased, and consequently cracking is a greater risk. While water curing has long been recognized as the most effective form of curing, application of curing compounds is an accepted alternative method where water curing may be impractical. NZ3109 defines the procedure as being “the application of a membrane forming curing compound conforming to AS3799 or ASTM C309”. These standards also state that “auto desiccation” i.e. a lack of adequate internal moisture, is likely to occur in low water cement ratio concretes under a membrane cure. 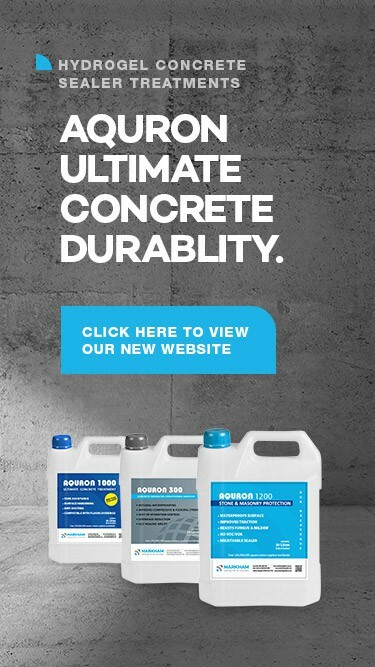 The Standard regards sodium, lithium and potassium silicate formulations as being “chemically reactive” rather than membrane forming and considers these products to have limited benefit in preventing moisture loss in fresh concrete, but not providing the degree of moisture retention required to maximize hydration. HOW DOES AQURON FIT IN HERE? In 1985, research led to the development of a unique catalyst which causes solutions of colloidal silicates to react and be drawn deeply into the cementitious matrix immobilizing all free moisture in a combination with alkaline hydrate components of the cementitious paste to become an extensive hydrogel formation within the concrete. It is this physical transformation of moisture within the concrete that distinguishes the colloidal hydrogel forming AQURON products from simple chemically reactive silicate formulations. AQURON solutions are entirely distinct to other sodium, lithium or potassium silicate formulations. This internal binding of the moisture within the concrete is more appropriately compared to “internal concrete curing methods” and has been seen as being especially effective in concrete mix designs with low water/cement ratios (0.48 or less). Internal concrete curing methods are distinguished by their ability to ensure there is adequate moisture within the concrete to maximize hydration of the cement. HOW DOES AQURON RELATE TO THE DEFINITION OF CURING COMPOUNDS IN THE STANDARD? While it is accepted and understood that AQURON solutions are not membrane forming as specified by the ASTMC309 or AS3799 standards/test procedures they nevertheless have proved to be able to meet the moisture retention requirements of these standards. Independent, accredited testing has verified moisture retention as being in excess of that required by ASTMC 309/AS379 providing there is an adequate cement content in the mix design of the test samples. Independent laboratory testing has confirmed that AQURON when tested to ASTM C156 test method has reduced moisture loss in sample concrete over a period of 72 hours to 0.28g/m2– almost less than half the required threshold of 0.55g/m2. While AQURON solutions have been tested against the standards using approved modifications to the test method and found to meet and/or exceed the moisture retention criteria, a more meaningful benchmark against which to measure the effectiveness of the AQURON is by using 14 day water curing. Unisearch in New South Wales, Australia compared the properties of slabs treated with AQURON at time of final set and others cured by a spray application of water and covered with plastic for 14 days. The results clearly demonstrate that timely and correct application of the AQURON solutions is comparable to 14 day water curing of concrete.